Now one of my favorite art books, by Betty Edwards, will be the basis of a new class I plan to teach on drawing. The best artists I know use regular drawing practice as a way to stay sharp, and to keep the connection between their hand and their eyes as coordinated as possible. 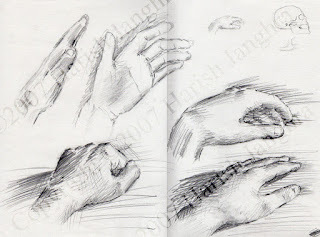 Whether you are a beginner or a more established artist, I think this class may help you to set aside the time to improve the connection between your eyes and your hand. Pianists, string players, musicians of all stripes take lessons and practice regularly. Somehow as artists, we seem to forget the need to simply practice or warm up. We begin to think that we should somehow be able to come to our serious work and just DO IT. I am a firm believer that art class can be like having a personal trainer in the gym. It’s a way to make yourself accountable for taking the time to do something you want to do anyway. Your classmates will become someone with whom you share the experience. It’s all good!! I’d love to have you join me and look forward to a few weeks of sharpening our drawing skills. I hope you will come out for what is bound to be a great class. Minimum 4 required to begin.